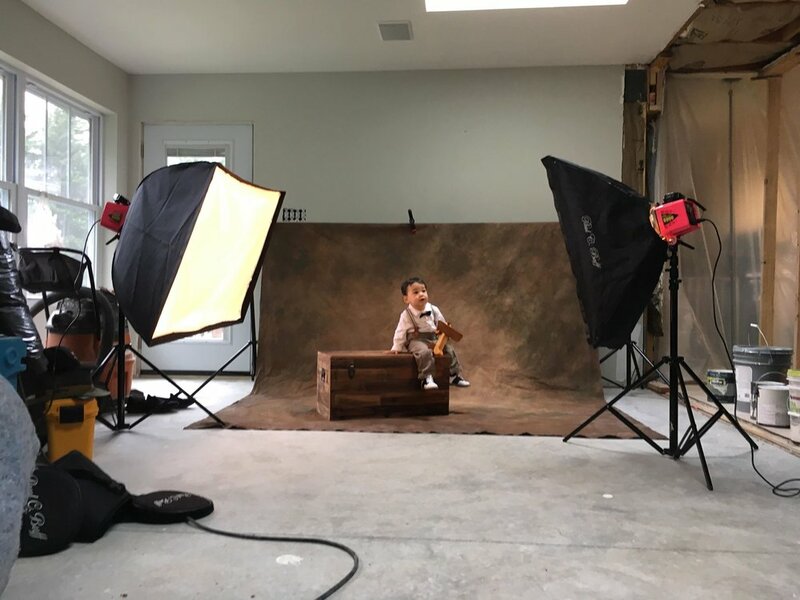 When Joseph’s mom contacted me about pictures for his first birthday, I was happy to oblige for what she envisioned but I asked her if she would indulge me and allow me to bring Joseph into the studio. Photo shoots on location are great but I wanted to do something a little more formal for him, especially when he is absolutely styling. This kid is GQ ready! There is an advantage to using studio strobes with small children - it can freeze action which, when dealing with fast-moving toddlers, can be a benefit. And it allows for what I like to say is a more “painterly” effect, which makes a studio portrait timeless and classic. But I also wanted to try something else. Some time ago, I read a book called “Studio Anywhere” by Nick Fancher (a “must read” for photographers) and he related in this book about how as a New York City photographer, he had to learn to be creative with the small spaces of big city apartments (not to mention having to lug gear around on the subway). And speaking of New York City - my hometown - I have memories of my mother hiring a photographer to come to our home to do formal pictures of me and my older sister. Right there, in our little Bronx living room. So why not try that? I told Logan, Joseph’s mom, that I would come to her. Here’s the scenario: a house currently undergoing major remodeling to add an addition and extend the living area. Ideal, right? Nothing like plaster and dry wall and studs to shoot around. But . . . it worked. I set up a small studio in the work area (what’s a little plaster dust?) and more importantly, Joseph got to be in familiar surroundings, which made him more comfortable and not as likely to be distracted. Check out this handsome little man! So why not schedule a portrait session in your home? You would be surprised what could be used to accommodate a “studio anywhere” - a bedroom, the garage, even the backyard (assuming it isn’t pouring rain as it was today). The studio lights are supplying the light, not the ambient light, so it can be a dark room or a basement. See? You would never know there was major construction going on around our set. Yes, I do. I am pleased to announce that I will be setting up a formal studio in downtown Powell, in the historic Groner Building that was part of the old depot. Stay tuned for announcements about its opening!